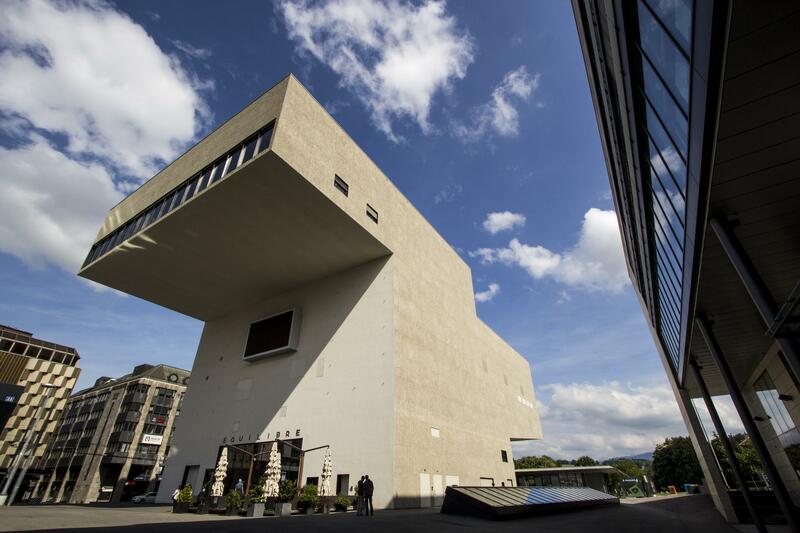 Issue of an architectural competition launched by the towns of Fribourg, Villars-sur-Glane, Granges-Paccot, Givisiez and Corminboeuf in July 2000, the theater, now called Equilibre (Balance) is the work of the architect Jean-Pierre Dürig from Zurich. Built in the city center, its urban location and its big and atypical form, challenge, create emotions, stir the passions fueling imaginations. This emblematic building leaves no one indifferent. The theater is already looming as a contemporary symbol of the city. The shape of the building is not limited to the symbolic, it also reflects the functions contained (stage - hall - rehearsal room - dressing). Its size encourages a minimal floor base. The object itself is organized in three complementary sectors. The center houses the entrances, the hall and the stage. Thethater and the bar are located next to the park. On th other side, the city side, the building contains offices and rehearsal rooms.